Pirms krāsniņas pirkšanas būtu jāizvērtē, cik daudz maizes plānojat cept, piemēram: 500 vai 1000 g.
Ir arī tādi maizes krāsniņu modeļi, kuriem ir svara izvēles funkcija, kad Jūs pats varat izlemt – cept 500, 750g vai 1000g smagu maizes kukulīti. Starting breakfast with a freshly baked crusts of bread, spread with homemade jam - that's a life! By the way, there is no need to spend the night at the hotel for that. 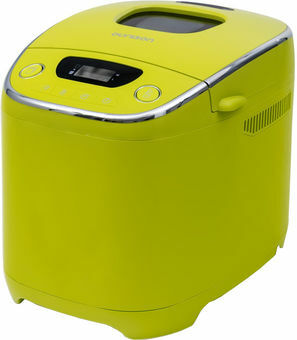 We have something for you - bread maker, which is ready to please you with different varieties of bread every day. 10 automatic programs will do everything for you. Just put the ingredients and the process of preparing dough and baking is not your concern. Smart bread maker will ask what color of crust would you like - brown, light, medium or dark, and do everything as requested. And even will keep the bread warm for an hour after baking. "And where to take jam? ", you'll ask. It knows hot to prepare it.